Welcome to Turkey Ridge, a secluded hideaway for the whole family. Drive back in time as you follow a quarter mile narrow private lane along the Salt Creek to a quaint but modern country farmhouse incorporating a 100 year old cabin. Sited on 5 acres, including a working farm and apple orchard; surrounded by 280 acres of farmland, woodland and creek; adjacent to the Yellowwood State Forest, this home offers complete privacy and solitude as you immerse yourself in country life. This home seamlessly blends the old time farmhouse (the surrounding land has been a working farm for at least 100 years) with modern amenities. You will enjoy spacious living with four bedrooms, 4 bathrooms, 2 kitchens, 2 game rooms, a sun room and 6 porches. The house is decorated throughout with antiques, quilts, woodturnings and original artwork allowing you to take a step back in time to old Brown County. As you enter this farmhouse, you are ushered into the open floor plan. The living room features leather sofas and recliner, antique furniture and displays, along with a 42 inch wide screen TV with satellite hookup. Large sliding glass doors allow a continual view of the surrounding countryside. The spacious kitchen is completely equipped with all the amenities for preparing and enjoying a family dinner, including cherry cabinets, plenty of counter space, a large refrigerator, microwave oven, stove, dishwasher and a family farm table situated in front of large windows for outdoor viewing. There is a beautiful sunroom for your quiet morning time, where you can watch wild life while enjoying breakfast. While the main floor is ideal for communal activities, there is plenty of opportunity for privacy. A master suite is located in the adjoining cabin and includes a sitting room with antique pine floors and trim, a stone fireplace, a TV with satellite hookup, a screened in private porch, a queen bed in the bedroom and an adjoining bathroom with walk in shower. Upstairs is a loft reading and game area. There is both a private bedroom with a queen bed and adjacent bathroom and a loft style open bedroom with twin beds and a balcony porch on the upper level. The basement level offers a game room, equipped with a pool table, and a private efficiency suite. The suite is complete with kitchen with a stove, microwave oven, sink, refrigerator, coffeemaker; a breakfast area; a bathroom with shower and tub; a TV with satellite hookup, a full bed and a sitting area. There is a private exit to the orchard hillside. Outdoor activities abound. Two private ponds are available for catch and release fishing and a shallow ford site on the Salt Creek is accessible for wading, geode hunting and fishing. 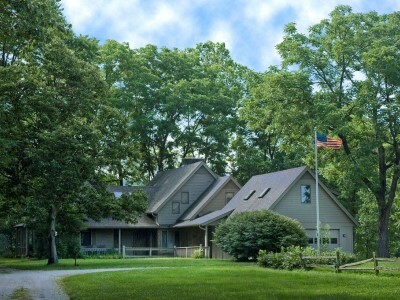 Explore the orchard, pastures and private woods adjacent to the house or set out on hiking trails located in the Yellowwood State Forest, including the Ten O'Clock Line Trail, all within walking distance of the property. Alternatively, choose a porch (there are 6 of them, plus the sun room), sit, relax and enjoy the view over pastures, fields, the Salt Creek and wooded hills. Wildlife is plentiful, and you will see deer and turkey traveling across the pastures. In the evening unwind by enjoying a campfire with friends and family. Situated midway between Nashville and Bloomington and two miles north of State Road 46, this is a perfect location for exploring the shops of Nashville, antiquing in Brown and Monroe Counties, enjoying fine dining and the Big Ten sports experiences at Indiana University, or just staying on the property and enjoying the company of family and friends.